Do people ever ask you, "What's your favorite color?" I never had a good answer for that question. I like them all. There are a dozen shades on the left side of this page, each of them admirable in its own way. For a while, I was partial to dark cyan, a blue-green background color that contrasts nicely with complementary red and yellow accents. 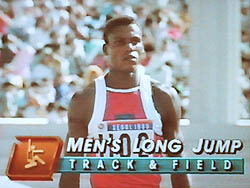 NBC ratified my opinion by using the hue on its graphics for the Seoul Olympics in 1988. But then several professional sports teams adopted this "teal" as one of their colors, and it became more ordinary. Lately, for philosophical reasons, I've decided that my favorite color is gray. 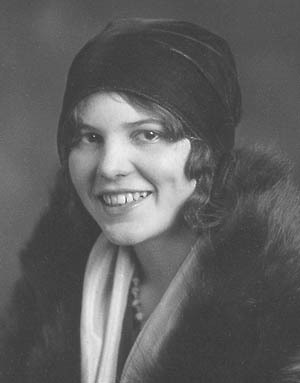 Here's a black and white photo of my mother from the 1930s. It's a beautiful picture, isn't it? No? Not really? What's wrong with it? Well, it's only black and white. Shades of gray have been prohibited. Either-Ors sometimes try to persuade us by refusing to accept shades of gray. They set up what is called a false dichotomy, in which they claim that only two possibilities exist, black or white. If we accept this dichotomy, they then point out the faults of "black." Because there are no other possibilities, we must conclude that "white" is our only reasonable choice. EXAMPLE: Suppose that Uncle Clem reports there was a ghost in his room last night. Either-Ors will claim that there are only two possibilities: either Uncle Clem really saw a ghost, or he's lying. But Clem has never been a liar. Therefore, he must have seen a real ghost! This conveniently ignores other possibilities, including the likely one that Clem saw something ordinary that he honestly believed was a ghost. Maybe the kids next door were playing a prank on him. Either-Ors claim that at a fork in the road, there are only two ways to go, left or right. Since there are problems with "left," all reasonable people will avoid it and go "right." Exploring the woods to discover an alternate path is not even considered as a possibility. EXAMPLE: A human being's body is a very complicated organism. Advocates of Intelligent Design say that there is no way such a complex thing could have come into existence by mere blind chance. Therefore, they say, there must have been a Designer, which they generally take to mean God the Creator. However, "chance" and "design" are not the only possibilities. A third possibility, a very good one, is evolution. "Evolution is the same as chance!" the Intelligent Design proponents protest. "No, it isn't," the scientists explain. One part of evolution does indeed involve chance, in the form of random mutations that may or may not render an organism better able to pass on its genes. But that's not enough by itself. The other very important part is natural selection, which weeds out the bad mutations and allows the good ones to become predominant. Over thousands or millions of generations, blind chance edited by natural selection can indeed produce new species. Movie reviewer Scott Renshaw tweets, Two things I read today got me pondering binary thinking. It's nothing new, of course, but it feels like a defining pathology of our time: the inability to recognize that a thing can be x and y. A politician can't be really conservative or liberal if they stray in one way from someone's strict parameters. It's all or nothing. A movie you loved for years becomes a piece of crap as soon as you realize something about it makes you uncomfortable. I wish so desperately that people could begin more thinking with the possibility that both things can be true. Of soooo many things. Deciding to do something may be binary  yes or no  but deciding what you think about a movie or a person doesn't have to be. And I'm convinced that much resistance to trans identity is an inability to process identity as anything but easy-to-define binary. White hat vs. black hat, good vs. evil, is the stuff of melodrama. We don't have to think too hard about whom to root for, and why. It's also kind of a childish way to go through life. Embrace gray areas, or you get the world you deserve. EXAMPLE: The President may claim that we have only two choices. Either we support his Administration's foreign policy, or we support our country's enemies. Therefore, any so-called citizen who publicly disagrees with the President's decisions is a traitor, because he is giving aid and comfort to the enemy. If we accept this dichotomy, we hand our political leaders a blank check. They can do anything they like, and all true patriots are bound to support them. No one is allowed to suggest that there might be another way, that other policies might better achieve the same goals. Has not the President proclaimed, "If you're not with us, you're against us"? Just as there are parents who love their children but correct them when they misbehave, there are Americans who love our nation but want it to be even better. However, if I have a dream, I must forget it. I must somehow love America without trying to improve it, for the dichotomy gives me only two choices: "America, love it or leave it!" I prefer the third verse of "America the Beautiful," which admits that our nation still has flaws that need mending. When I was growing up, I puzzled over the dichotomy in the 25th chapter of Matthew. He will separate people into two groups, as a shepherd separates the sheep from the goats; he will place the sheep on his right hand and the goats on his left. Apparently if we're kind to one insignificant person, we go to heaven, but if we're callous to one other insignificant person, we go to hell. However, we encounter many people in our lives. Is the Great Scorekeeper keeping score? If I see 5,182 hungry people and feed 4,447 of them, is that sufficient to qualify me as a sheep? Or does my failure to feed the other 735 make me a goat? There's no middle ground for ordinary humans who want to do the right thing but sometimes fail. So sometimes shades of gray are excluded because the Either-Ors want to leave us with only two possible choices, their way or the eternal fire. They know that once we accept this limited menu, our only real choice is their way. In other cases, shades of gray are excluded because of ignorance. It's easier for us to consider only the possibilities that come readily to mind, without taking the trouble to search out others. EXAMPLE: This puzzle consists of 24 matchsticks forming squares. Can you remove exactly eight matches and leave only two squares? After looking at the diagram for a while, many people will say there's no way. They can even prove it mathematically. Removing eight matches will leave 16 of them. A square can be constructed with only four matches, so two such squares will require only eight matches (or seven if the squares share a side). There will be eight or nine matches left over. It can't be done. Often in my work, we're trying to accomplish some minor task. After considering for a few seconds, someone will say, "Well, the only way we can do it is to use this method." How does he know that's the only way? It's merely the first one he could think of. Give him some more time, or consult other experts, and alternatives might turn up. EXAMPLE: I used to be involved in editing the Penn State Football one-hour TV show each Saturday evening. In the first segment, our announcers would say something like, "Another big win today for the Nittany Lions." Then followed a condensed version of the game, which required several hours to edit. We assembled it onto a reel of videotape so that we could take it to a satellite uplink facility early Sunday morning. But we had a special problem if the "Saturday afternoon" game was played on Saturday night. Because of our impending deadline, we had to start editing early, in fact while the game was still going on (usually before halftime, even). The first segment on the reel was our announcers' introduction, so it had to be taped before kickoff. No longer could the announcers describe the outcome of the game. When the show aired the next day, they looked like they didn't know what was going on, and our boss complained about it. My supervisor said, "That's the only way it can be done! We can't wait until the game is over to start the edit." But it didn't take me long to find a way to edit out of sequence, so that the first segment could be taped after the game was over and shoehorned into its proper spot on the reel ahead of the already-edited first quarter of action. It wasn't very difficult. Alternative possibilities do exist, even those that we haven't thought of yet. Considering other possibilities is often called "thinking outside the box." Artificially restricting the possibilities is the easy way out. Let's not be lazy. Let's allow for many, many shades of gray.